^ Kolata, Alan L. Quinoa (PDF). Quinoa: Production, Consumption and Social Value in Historical Context. Department of Anthropology, The University of Chicago. 2009. ^ Keppel, Stephen. The Quinoa Boom Is a Lesson in the Global Economy. ABC Univision. March 4, 2012 [16 March 2013]. ^ Popenoe, Hugh. Lost crops of the Incas: little-known plants of the Andes with promise for worldwide cultivation. Washington, D.C.: National Academy Press. 1989: 149. ISBN 0-309-04264-X. ^ Gade, Daniel W. Nature and culture in the Andes. Madison: University of Wisconsin Press. 1999: 206. ISBN 0-299-16124-2. ^ Bailey, Garrick Alan; Peoples, James. Humanity: an introduction to cultural anthropology. Belmont, CA: Wadsworth Cengage Learning. 2009: 120. ISBN 0-495-50874-8. ^ Tom Philpott. Quinoa: Good, Evil, or Just Really Complicated?. Mother Jones. [2013-11-24]. Pulvento C., M. Riccardi, A. Lavini, R. d’Andria, & R. Ragab (2013). SALTMED Model to Simulate Yield and Dry Matter for Quinoa Crop and Soil Moisture Content Under Different Irrigation Strategies in South Italy.. Irrigation and drainage. doi:10.1002/ird.1727. Cocozza C., C. Pulvento, A. Lavini, M.Riccardi, R. d’Andria & R. Tognetti (2012). 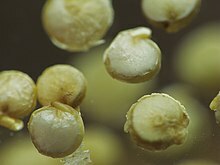 Effects of increasing salinity stress and decreasing water availability on ecophysiological traits of quinoa (Chenopodium quinoa Willd.).. Journal of agronomy and crop science. doi:10.1111/jac.12012. 请检查|doi=值 (帮助). Pulvento C, Riccardi M, Lavini A, d'Andria R, Iafelice G, Marconi E. Field Trial Evaluation of Two Chenopodium quinoa Genotypes Grown Under Rain-Fed Conditions in a Typical Mediterranean Environment in South Italy. Journal of Agronomy and Crop Science. 2010, 196 (6): 407–411. doi:10.1111/j.1439-037X.2010.00431.x. Pulvento, C., Riccardi, M., Lavini, A., Iafelice, G., Marconi, E. and d’Andria, R. Yield and Quality Characteristics of Quinoa Grown in Open Field Under Different Saline and Non-Saline Irrigation Regimes. Journal of Agronomy and Crop Science. 2012, 198 (4): 254–263. doi:10.1111/j.1439-037X.2012.00509.x. Gómez-Caravaca, G. Iafelice, A. Lavini, C. Pulvento, M.Caboni, E.Marconi. Phenolic Compounds and Saponins in Quinoa Samples (Chenopodium quinoa Willd.) Grown under Different Saline and Non saline Irrigation Regimens. Journal of Agricultural and Food Chemistry. 2012, 60 (18): 4620–4627. PMID 22512450. doi:10.1021/jf3002125. Romero, Simon; Shahriari, Sara. Quinoa’s Global Success Creates Quandary at Home. The New York Times. March 19, 2011 [July 22, 2012]. Geerts S, Raes D, Garcia M, Vacher J, Mamani R, Mendoza J, Huanca R, Morales B, Miranda R, Cusicanqui J, Taboada C. Introducing deficit irrigation to stablize yields of quinoa (Chenopodium quinoa Willd.). Eur. J. Agron. 2008, 28 (3): 427–436. doi:10.1016/j.eja.2007.11.008. Geerts S, Raes D, Garcia M, Mendoza J, Huanca R. Indicators to quantify the flexible phenology of quinoa (Chenopodium quinoa Willd.) in response to drought stress. Field Crop. Res. 2008, 108 (2): 150–6. doi:10.1016/j.fcr.2008.04.008. Geerts S, Raes D, Garcia M, Condori O, Mamani J, Miranda R, Cusicanqui J, Taboada C, Vacher J. Could deficit irrigation be a sustainable practice for quinoa (Chenopodium quinoa Willd.) in the Southern Bolivian Altiplano?. Agric. Water Manage. 2008, 95 (8): 909–917. doi:10.1016/j.agwat.2008.02.012. Geerts S, Raes D, Garcia M, Taboada C, Miranda R, Cusicanqui J, Mhizha T, Vacher J. Modeling the potential for closing quinoa yield gaps under varying water availability in the Bolivian Altiplano. Agric. Water Manage. 2009, 96 (11): 1652–1658. doi:10.1016/j.agwat.2009.06.020.